It will be one of the best decision of your life that you want to start a blog. I can tell you a number of benefits of starting a blog. 20 years back, you had no identity if you did not have an email address. 5 years back it became compulsory to have a Facebook or Twitter account. Within next 5 years, your blog will become your identity. However that’s not the reason I want to convince you to start a blog now. Wideinfoweb.org is my blog. I have started this blog 3 years back. My blog not only gave me lots of MONEY but FAME as well. This is my income from Google AdSense and it’s one of the many incomes from my blog. Why you should not start with a Free Blog? If you are in confusion or heard from somewhere that starting a blog is free, then I will take just a few minutes of yours to explain to you it’s really not. There are sites like Wix, WordPress.com, weebly and others that give you a free blog but a free blog has many limitations. Your blog will be hosted on a subdomain like yourname.blogspot.com or yourname.wix.com which become lengthy and difficult to read but not short and easy like yourblog.com. Your clients, your advertisers and most importantly your readers don’t take you seriously. There are many limitations to design & monetize your free blog. All your content are ultimately controlled by the free blogging platform. You can’t do anything if they delete your content or even free blog. These are the problems with a free blogging platform like Wix and even WordPress.com, etc. Also, I know hundreds of Innovators who started from the free platform, when they wanted to shift from free to the paid platform (after they got some response), and how cumbersome it was to shift. And not only the shifting problem, but they also lost the audience, traffic and revenue in transferring from Free to their self-hosted Blog. So, I recommend you a paid blog with WordPress.org with a very reliable web host. Also, it does not cost more than $75 for a year. Here are the 6 simple steps that will help you in starting your blog. There are a number of blogging platforms like WordPress,Webnode, Wix, etc. But WordPress.org is the most important blogging platform from the last few years because of many good reasons. Creating a blog using WordPress is very easy. You can design almost any type of website with the help of 5000 free and paid WordPress themes. It offers 50,000 free plugins that make your blog very fast & efficient. You can find help on almost any topic on WordPress Forum or other blogs. Here I am talking about WordPress.org and not free blogging platform WordPress.com. WordPress.org is a software and its free. You need to buy a domain and hosting for using this WordPress.org platform. Choose your domain name wisely. Wideinfoweb.org is the name of my domain and anyone can understand this blog is something about Money. My another blog or can say my personal website on weebly is Webtech . Another important thing about these domains is that they are easy to pronounce and remember. So you choose a domain name in such a way that people can understand the topic of your blog from the name itself. If you want to start a cooking blog, then the name must be related to cooking, if a sports blog then something related to sport, if its related to technology then some tech-related name. Like email address, it’s challenging to get a domain name of your choice, so you need to prepare a list and then check the availability. From the available domains, you can finalize the best. You can find many domain extensions other than ‘.com’. Most of the other common domain extensions are .org, .net, .co.uk, .co.in, .info etc. You can check all at the time of domain booking. As I told you, WordPress.org is nothing but a software. You can’t create your blog using just software. You need a web hosting space where you can install WordPress software. Just like you need space in your mobile and PC to store and see your files, images, and videos, you need web hosting to store the content of your blog, images and videos. You need to buy a web hosting in order to use your own domain name and to make it accessible to the world. I have created hundreds of blogs in the last 5 years, and I have used & experienced almost all the web hosting providers. One of most reliable hosting I found is from Bluehost. Even WordPress.org and other top bloggers recommend www.bluehost.com. And Black Friday is the best time of the year when millions of people want to buy hosting for their blog. You can get almost 60% discount on hosting from bluehost. 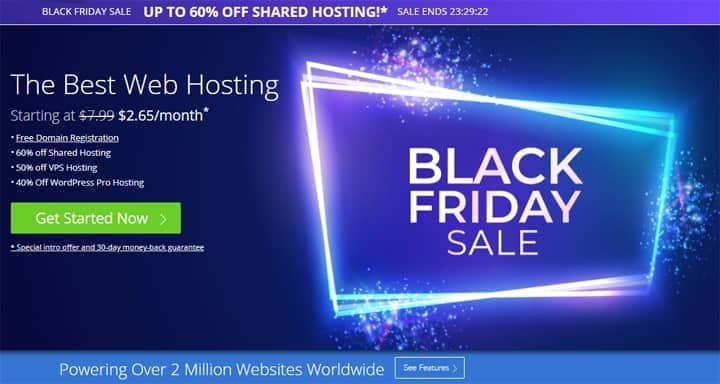 You can get bluehost hosting just for $2.65 per month instead of $7.99 per month during Black Friday sale. Not only that, you get your domain for free if you signup for 1 year or more extended period. 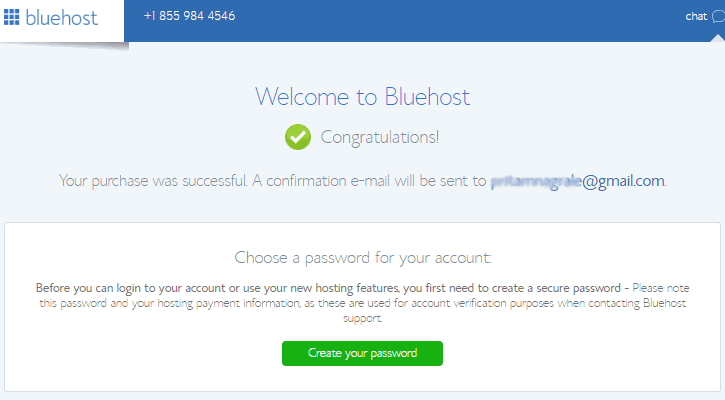 Just visit www.bluehost.com, and you will find screen something like this. You may find something different but it will be similar so it won’t be difficult for you to understand where to begin. Click on “Get Started Now” button. You then visit the hosting plan page. There are 3 types of plan. If you are planning to start only 1 blog, then ‘basic’ is sufficient for you but if you want to create more blogs in future, then you can choose ‘Prime’ because you can use multiple blogs in the same hosting. You even get Domain Privacy for free. Click on Select to choose your plan. Next it ask you to type your domain name. I have already discussed above how to choose the domain name for your blog. If you have something in mind then enter it in ‘new domain’ and check for availability. For example, I want to create a technology blog. After so many trial, I finalize my domain name ‘Wideinfoweb.org’. You can try different names for your domain and if your finalize a domain then click “Next”. 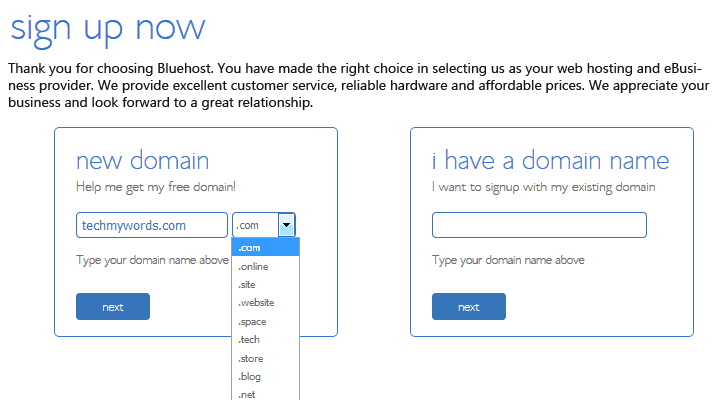 If you have an existing domain with another domain registrar, then you can use that with Bluehost hosting. You can type that domain name in the “I have a domain name” field and Click ‘Next’. 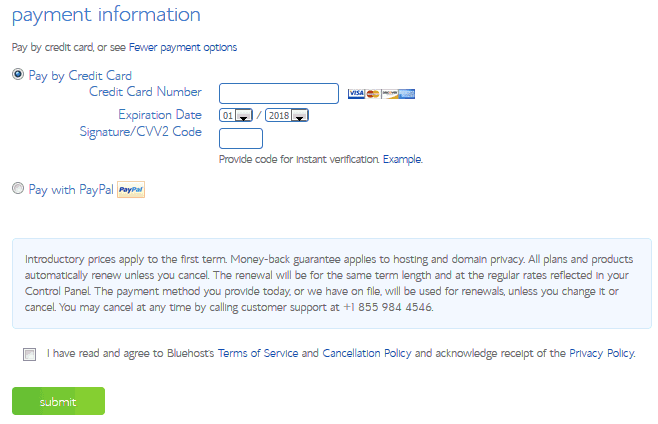 Then update the name server of your domain with the one provided by Bluehost. There are many domain extensions other than .com. It’s not necessary to use ‘.com’ domain extension only. You can try other extensions like .net, .org, .info and others as shown in the image above. If you want to choose your domain name later, then click on “Choose Later” link and then choose your domain later from your Bluehost account dashboard. Next step in starting a blog is completing your registration. You need to put your information and other formalities. 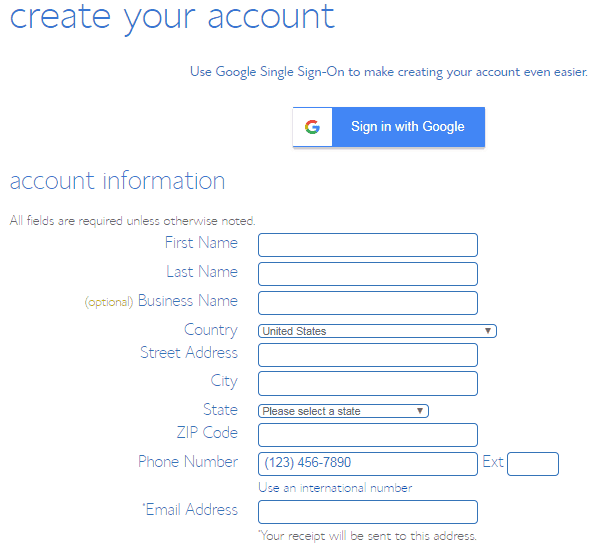 You can signup with your Google account or enter your information as shown in the image below. Next, choose your plan. 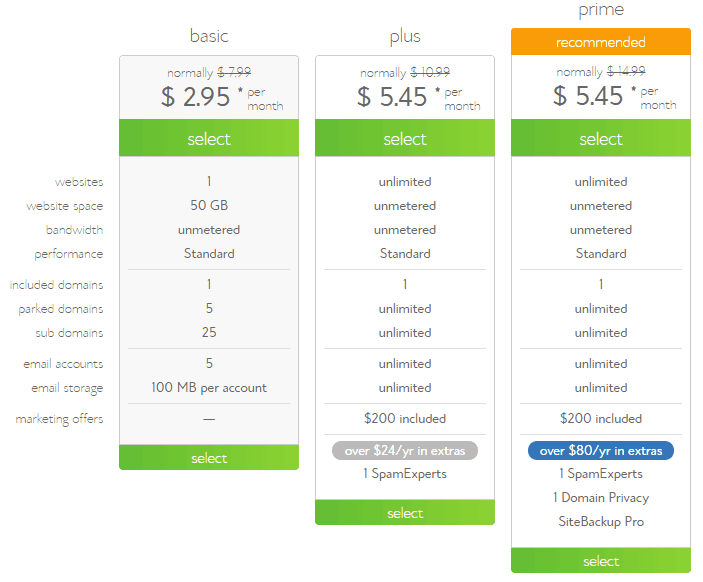 I recommend you to buy for 36 months because you get the lowest rate of $2.95 per month if you choose for 36 months. If you buy for 12 months, then the price is $4.95 per month. You will get ‘Let’s Encrypt SSL’ free for all plans. SSL will make your site from ‘http’ to ‘https’. When people visit your site, their browser tells them that this is a secured website. This builds trust among your readers. 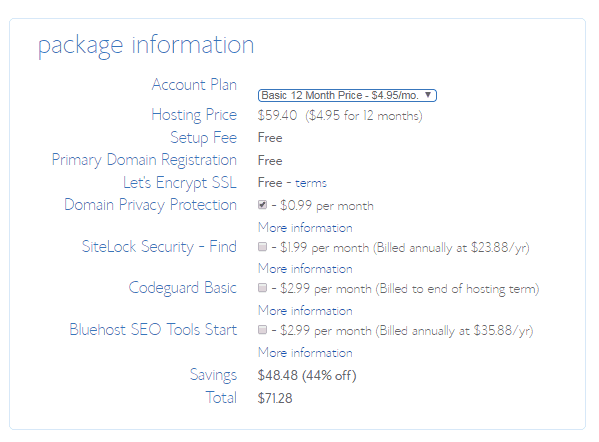 You don’t need to buy SiteLock Security, Codegurad Basic and Bluehost SEO Tools. Just untick all the checkboxes so that you can see the total price. You can buy ‘Domain Privacy Protection’ which help you to protect you from Spammers. If you don’t want that, untick that as well. I highly recommend you to grab that offer immediately because you also get ‘Free Domain Privacy’. Next, scroll down and enter your credit card details. You can also pay by your PayPal account. Choose whatever suitable for you. Then tick the checkbox of ‘Terms of Service’ button and click on ‘Submit’ button to complete the order. You then visit the next page where Bluehost welcome you for purchasing the hosting towards the first step start your blog. Now click on the green button to create your password. Create a strong password. 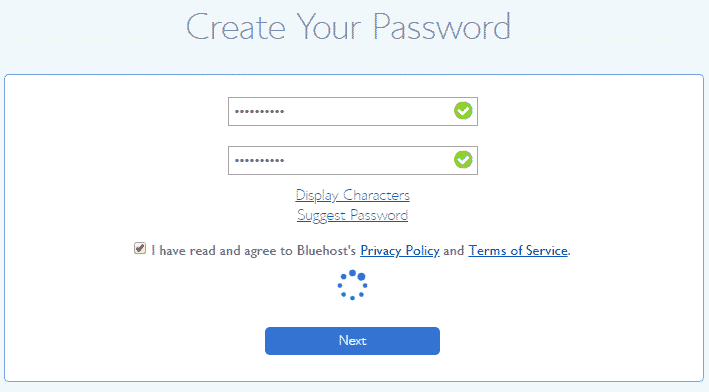 Bluehost will suggest you if your password is weak. On the next page, you will be asked to choose a theme for your blog. If you like any theme for your blog, you can choose now, otherwise, click on ‘Skip’ button at the bottom to choose your theme later. Bluehost host your blog on a temporary domain for 12-24 hours if you had chosen your domain name as explained above in step 2. Even if you had selected ‘Choose Later,’ even in that case, your blog will be hosted on a temporary domain, and when you book your domain later, it automatically removes the temporary domain and adds your own chosen domain. Now you can start creating your blog. Here you can either go directly to your WordPress blog dashboard by clicking on ‘Start Building’ or go to your Bluehost account by clicking ‘go to my Bluehost account’. You can login to your WordPress account of your blog directly from this page. Now we will see next important part of starting your blog. You need to do some of the most important things immediately after creating your blog. If you chose a new domain in step 2 ‘Type Your Domain Name’ above, then you will receive a WHOIS Verification email. Open your email and click on “Verify Your Email” link to activate your domain. Then log in to WordPress account by clicking on “Log in to WordPress” from your Bluehost account. 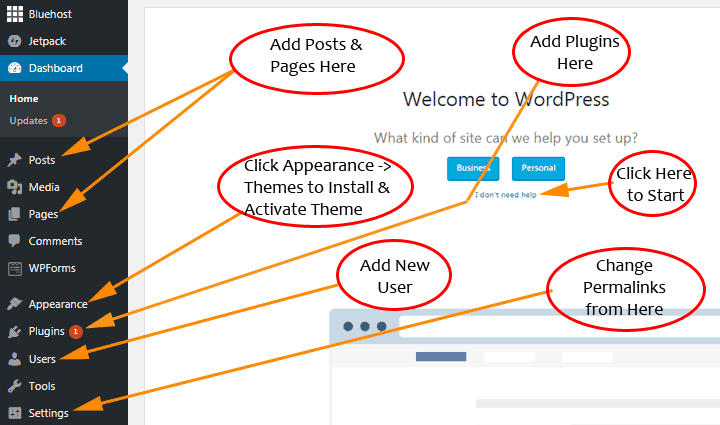 After login you will find WordPress dashboard like this. It ask you Business or Personal site. Just click on ‘I don’t help link’ as shown in the image. Refer this image to do other things related to your blog setup. This is the first thing to do after starting a blog. When Bluehost installs WordPress on your hosting, it provides you with the default username ‘admin’ which is not good. Spammers and hackers can attack your blog with spam and malware. You need to change this with strong username and password. There is no provision to change the username in WordPress. You need to create a new user and delete the default user ‘admin’. Click on ‘Users’ as shown in the image and then ‘Add New’. Enter the details of the new user. Username, Email, First & Last Name. Click on ‘Show password’ to see the password of your WordPress blog. If you want, you can change. Find here the details of your WordPress blog account. Username & Password will be as given in the above steps. Now logout of your WordPress account and login again with new username & password using the above login URL link. Again go to ‘Users->All Users’. Select ‘admin’ user and delete this or change the role to ‘Subscriber’. You need to install or change your theme when you start a blog. 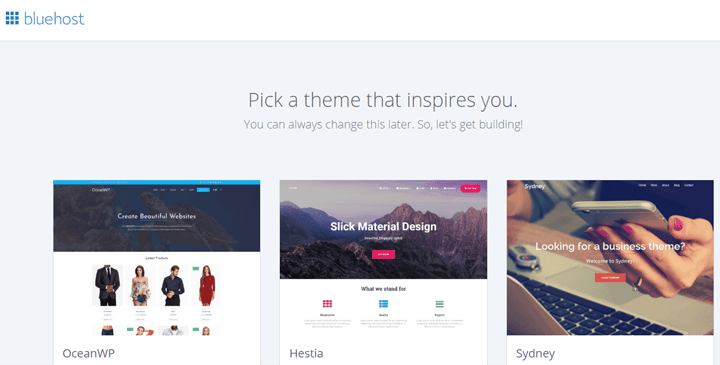 There are thousands of free & paid themes provided by thousands of developers. A theme will change the overall design, style, and layout of your blog. You can click on ‘Appearance –> Themes –> WordPress.org Themes’ to find free themes provided by WordPress. Do some experiments with the free themes and check which one you like the most. Chose a responsive theme so that it will be compatible with the smartphone. There are hundreds of premium themes outside WordPress provided by different companies. My favorite theme is Genesis provided by StudioPress. Premium themes have more features and easy to customize. WordPress plugins are like apps that allow you to add new features and functionality to your WordPress blog. You must install some essential plugins for creating your blog. Click on ‘’Plugins –> Add New’ and search for these plugins to install and activate. 1. Yoast SEO: One of the best plugin for on-page SEO and other things like creating a sitemap. 2. JetPack Plugin: Already installed by Bluehost. You click on JetPack plugin and then click on Setup button to setup this plugin. It’s is a multipurpose plugin where you can add things like contact form, share buttons, site stats and many other things. 3. Akismet Anti-Spam: This plugin will protect you from comment spammers. This plugin is already installed by Bluehost. You need to activate the plugin and go to the settings and then click “Get Your API Key” to get your free API Key for free to use this plugin. 4. WP Smush: Images are the great way to enhance the quality of your posts, but images take lots of storage space and at the same time slow down your blog. This plugin optimizes and compresses your image without reducing the quality of your images. It results in less storage and faster speed. There are other plugins that you can add like ‘Contact Form 7’, Google Analytics, Add to Any Share Button, WordFrence Security etc. Permalink is a great way to create a clean & SEO friendly URL. Just click on Settings -> Permalink to change your settings. Just select the ‘Custom Structure’ and enter /%postname%/ in the text box and click the “Save Changes”. It’s time to add your first blog post. You must write at least 1000 word blog post on your favorite topic based on your blog. Images make your content more attractive so add quality images in your post. You can find the images on sites like Pixabay, Canva to use on your blog. Click on ‘Posts –> Add New’ to add your first post. Add your title and content with images and click on “Publish” button to publish the post. Congratulation! You have published your first post after starting your blog. Different people have different purpose of starting a blog. Someone may use this as a hobby or personal blog. Someone may use this as a business blog. Alternatively, someone wants to become a professional blogger like me. However, making money with a blog is one of the most common goals to start a blog. Here are the steps if you want to make money after creating your blog. You must write on a regular basis after starting your blog. Your posts should have excellent research and original ideas where people can get something new. People like and share such content. More quality content you like, more the traffic you can get. This is the most important step to get the traffic on your blog. Making money without traffic is difficult. It takes time to get traffic on your blog. There are many things you can do to get traffic on your blog. Learn SEO and implement on-page & off-page SEO techniques on your blog. This way you can get good traffic from Google. Share your content on social sites like Facebook, Twitter, LinkedIn, Instagram, Pinterest etc. Write comments and guest posts on other blogs. This is the ultimate aim of every blogger after starting a blog. There are number of ways to make money from a blog but I won’t recommend many. I will keep it simple and suggest you just 2 ways as a beginner. You can make money with Google AdSense and Amazon. Sign up with AdSense (try only after you receive some traffic on your blog). Google displays ads on your blog similar to you see on this blog. When a visitor clicks on any ads, Google pays you. Another excellent way is making money as Amazon associate. Just signup with Amazon Associate USA or your country (available in all major countries). Login to your associate account and get an affiliate link for any product you want to promote through your blog. Whenever someone goes to Amazon by clicking on the affiliate link on your blog and buy something, you get 4% to 12% of the ordered amount from Amazon. Don’t look for any other ways right now as you will get confused and focus more on making money rather than making your blog successful. Even after 5 years of blogging, I prefer AdSense and affiliate marketing to earn from my blogs. I hope this guide is useful and it helped you to start your first blog. If you have any query, then you can ask through the comment or contact us page, and I will help you to start your blog and make it successful. Or you can join ShareaSale get an affiliate link for any product you want to promote through your blog.